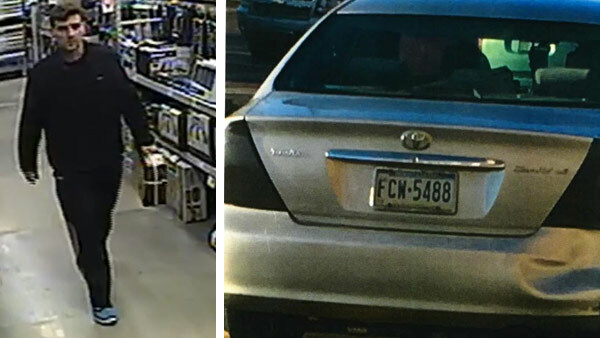 UPPER SOUTHAMPTON TWP., Pa. (WPVI) -- Police are looking for a man who's been stealing from home improvement stores in Bucks and Montgomery counties. Investigators are calling him the "Blue Sneaker Bandit" thanks to his choice of footwear. Police say he took power tool kits from the Strathmann store in Upper Southampton, as well as the Lowe's stores in both Plymouth and Warrington townships. The suspect is described as a white male, approximately 30 years old, with dark-colored hair. Along with the distinctive shoes, the man also wears dark-colored workout clothing.